I get a lot of questions about tofu. These days I think it’s something that people feel they are “supposed” to like. Or at least “supposed” to use. There is so much information out there about the impact that a meat based diet has on the planet and I think people are really starting to read and listen. People who are wanting to do something to minimize their impact often find eating less meat approachable. But what do you do if you don’t like tofu? First of all, let me say that you don’t have to like tofu. Even if you are a vegetarian. And there is no rule that says a vegetarian meal has to include tofu. I have many many recipes posted here on this blog and there are only four that include our little soy friend. There are tons of options if you don’t want to eat meat and are afraid of soy. Take a peek through the main course section over on the right hand side bar and I think you’ll find some lovely things to eat. That said, I do think tofu gets a bad rap. It’s not a meat substitute – it is it’s own thing. The most common complaints I hear is that tofu doesn’t taste like anything and that it is mushy. Tofu doesn’t taste like much on it’s own but it absorbs other flavors beautifully. If you make some kind of delicious marinade or sauce, it will taste like your delicious marinade or sauce. And mushy? It doesn’t have to be so! If you buy extra firm (sometimes called super firm), the texture thing goes out the window. This salad is a new favorite of mine. First you marinate some extra firm tofu and then roast it at relatively high heat which firms it up even more. 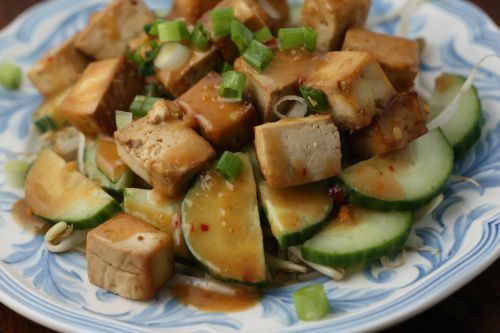 A bed of bean sprouts are laid on a plate, followed by thin slices of cucumber, the tofu, and an amazing peanut sauce is drizzled over the top. It is a wonderful salad to serve with a light Asian inspired meal. Of course, the salad is infinitely adaptable – cabbage, steamed broccoli, bok choy, even asparagus would be lovely here. Next time I make it, I am going to double the tofu so I have some extra to snack on. Yes, snacking on tofu. Try it! 1. Chill the tofu thoroughly. 2. To make the sauce: combine all the sauce ingredients in a small bowl and beat vigourously with a fork or small whisk until very smooth. 1. Slice the tofu into 1/2-inch-thick slices. Place them on a clean cotton towel or on paper towels. use another towel or more paper towels to pat the tofu very dry. Cut into 3/4 inch cubes. 2. Combine the soy sauce, sesame oil, and sherry in a large bowl. Add the tofu and use a rubber spatula to gently toss it with the marinade. Let marinate at least 30 minutes, or cover and chill up to 24 hours. 4. Place the tofu and its marinade in a single layer in a large shallow baking dish. Bake 30-35 minutes, or until golden all over and the marinade is absorbed. Shake the dish after 15 minutes to prevent the tofu from sticking. Can be served warm, room temperature, or cold. My husband and I love tofu…great source of protein. Love the idea of adding peanut butter. Great combination of flavors. By the way, thank you for visiting my site. I actually like tofu. I admit it. I like telling the haters that it tastes like tofu not nothing. Your salad sounds fantastic with the peanut sauce. Classic dish from SE Asia. I love it. We’re big tofu fans as well! This salad looks delicious, and I love cold salads that pack well for backyard and beach picnics this summer. Yum. Thanks for posting. I have recently become vegetarian and am fearful of cooking tofu! I thought a tofu satay or sorts might be a nice first stab at cooking it. Thanks for the recipe! I will definitely try it! I like tofu when I grill it a bit in oil. I also buy almond tofu (soft) for my smoothies. It’s delicious. Thank you for a delicious-looking salad from this tofu lover. Honestly, it’s one of my favourite foods – when it’s cooked so it’s a highlight of the dish and not ‘hiding’ as a substitute for something else. Do you have This Can’t be Tofu! by Deborah Madison? Great book. That peanut sauce sounds really tasty!